Join Bookmans at the 6th annual Celebrity Spelling Bee this Friday 8/25 at 7pm at The Rialto Theatre brought to you by the Educational Enrichment Foundation. This year EEF goes even bigger as this beloved Tucson tradition is set to premier at The Rialto Theatre in downtown Tucson. 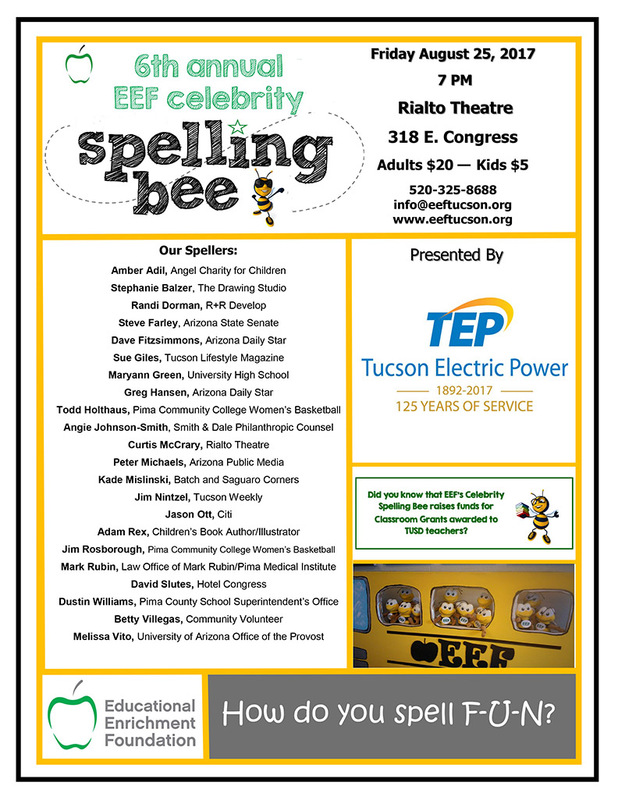 Tucson celeb Adam Rex and State Senator Steve Farley will be among the spellers competing for the top prize. Bookmans couldn’t be more excited for this phonemic event. This ain’t your 4th grade spelling bee but rather a celebration of early education, literacy and Tucson schools at the lovely Rialto Theatre. Not only will you witness the hilarity that is full grown adults trying to spell their butts off, but you’ll also be helping the Educational Enrichment Foundation raise funds for TUSD. Since 1983, EEF has been working tirelessly to support TUSD schools through grants, sponsorships and programs for educators. “The Educational Enrichment Foundation (EEF) is an independent non-profit 501c3 organization founded by Tucson’s community and business leaders in order to support the students and teachers within Tucson Unified School District schools. Established in 1983, EEF is the oldest foundation of its kind in Arizona and serves 49,000 Tucson Unified students annually. Through its grants, scholarships, professional development programs, and community activities, EEF actively provides enhanced and enriched learning resources for Tucson Unified students, teachers, and schools, advocates for educational excellence for all children, and ensures access to educational enrichment opportunities within Tucson Unified for financially in-need students. EEF programs are supported by corporate and non-profit grants, payroll deductions made by hundreds of dedicated Tucson Unified employees, and contributions from the general public. Pulled from the EEF website. Words, words, words….love it. Sounds like great fun! Thanks, Joe! We (obviously) love words too! This sounds like such a wonderful event! I would love to go!! If I don’t win the Powerball, this will be the perfect consolation prize! How exciting! Being able to find ways to enrich a child’s mind is amazing, and well worth the experience!